this iteration scheme converges very rapidly when (as is the case for planetary orbits). This expression allows us to give a simple geometric interpretation of the eccentric anomaly, . Consider Figure 4.5. Let represent the elliptical orbit of a planet, , about the Sun, . Let be the major axis of the orbit, where is the perihelion point, the aphelion point, and the geometric center. It follows that and (see Section A.9), where is the orbital major radius and the eccentricity. 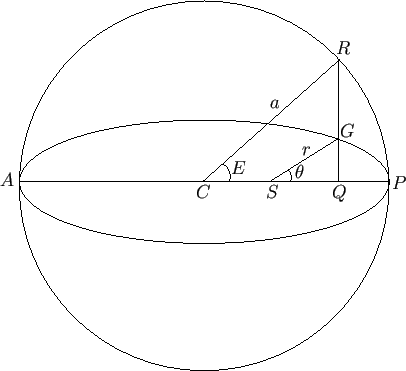 Moreover, the distance and the angle correspond to the radial distance, , and the true anomaly, , respectively. Let be a circle of radius centered on . It follows that is a diameter of this circle. Let be a line, perpendicular to , that passes through and joins the circle to the diameter. It follows that . Let us denote the angle as . Simple trigonometry reveals that and . But, , or , which can be rearranged to give , which is identical to Equation (4.62). We, thus, conclude that the eccentric anomaly, , can be identified with the angle in Figure 4.5. Here, , , and . Incidentally, it is clear that if then , , and . In other words, the motion is periodic with period .